The Race: Nightmares, Explosions and Geographic Origins. 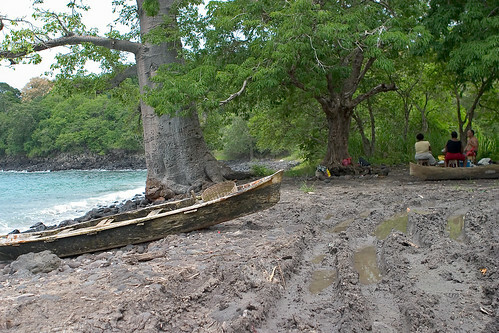 Before I get to expedition updates and cool biodiversity stuff, I must say I had recent cause to reflect on why I originally titled this blog, “Island Biodiversity Race.” As you know, major changes are coming to the islands, and we are desperately trying to learn as much as we can about their unique fauna and flora before these changes occur. 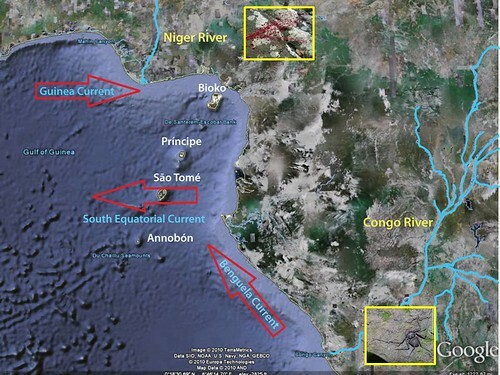 For blog newcomers, the exclusive economic zone of the Republic of Sâo Tomé and Príncipe impinges on oil-bearing ocean floor, and the tiny island nation is in partnership with Nigeria to exploit these resources. 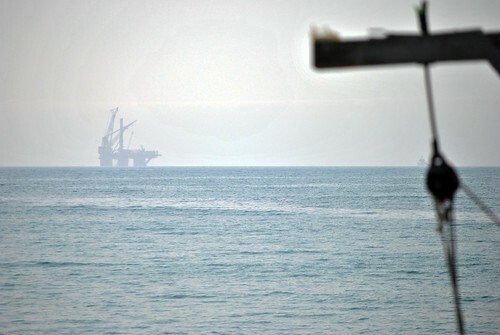 Without going into the record of environmental destruction associated with this industry, one can say at the very least that a large influx of wealth can be anticipated, along with the sorts of “development” activities that follow capital influx; and these activities almost always have a negative environmental effect. That’s why we are in a race to find out what’s there, so that we can inform the citizens (and the world) of what they have. Hopefully, when they have to make decisions down the road, they will have some knowledge of the potential environmental costs. There are already plans on the big island for a deepwater harbor and a significant extension of the runway at the airport. This is not rumor; on GG IV I spoke with several South Africans who are members of the group that is involved in these projects. In my view, a truly distressing plan is that of a different South African development group for Laguna Azul, one of the most beautiful and accessible sites on the big island. 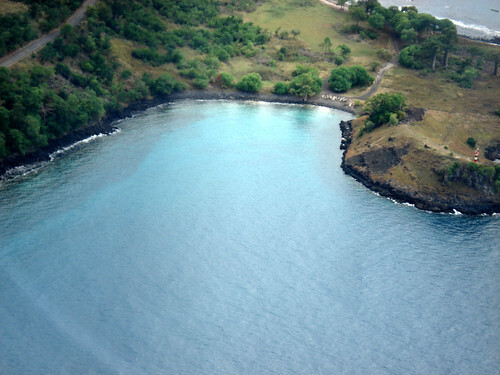 This cove on the northwest part of Sâo Tomé not far from the captol is as its name suggests, famous its beauty. It is the only spot on the islands where the baobab tree is found (Adansonia digitata), and I have watched Sao Tomean families picnic there. My understanding is that this development group plans to reroute the main road away from Laguna Azul, then construct properties and sell them off as kind of a gated community. There are rather frightening rumors about how permission for this project was obtained but as they are rumors only, I will not repeat them here. Time for critter news. A few weeks ago, our entomology department sent off the specimens from our millipede transacts to Dr. Rowland Shelley of the North Carolina State Museum. Recall that he had kindly agreed to try to identify them for us. He has a wonderful website on myriapods: http://www.nadiplochilo.com/milli.html So far as we know, only one short paper on the island millipedes has been published; curiously, this paper, written in 1993, was based on a small collection made on the road to São Nicolau in the vicinity of Nova Moca, where our biologist friend Ricardo Lima lives. By chance our first GG IV millipedes came from nearly the same spot, under a log shared with a cobra bobo (Schistometopum thomense)! Imagine an “ancestral” form of Globanus somehow reaching (by raft?) Príncipe and/or Sâo Tomé at a time when the islands were devoid of any other millipedes. Such a situation would present lots of empty niches into which, in the absence of any competition, the ancestral lineage would radiate, perhaps explosively.. Nature abhors a vacuum! A widely used example of this phenomenon is the swarms of different species of cichlid fishes in Lake Tanganyika, all descendants from a single colonizing species. Species swarms have apparently occurred on other Atlantic islands, Madeira being a prime example, with earwigs (Perirrhytus), true bugs (Chinacapsus), nine species of the beetle genus, Trechus and a woodlouse genus, Procellio. Another update: samples of earthworms collected on Sâo Tomé in 2002 by my colleage, Dr. John Measey, of the South African National Biological Institute were sent to Dr. Csaba Csuzdi, a Hungarian oligochaete specialist in Budapest (one of the things John Measey studies is what caecilians eat). 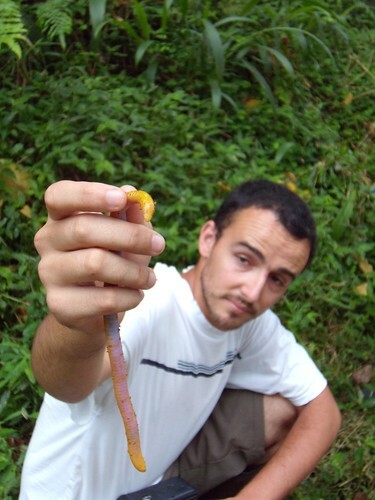 Several years later, Dr. Csuzdi, using both his own and John’s specimens, published a comprehensive treatment of the earthworms of Sâo Tomé, recognizing 18 species. Six of these (33%) are endemic to the island, and all six of them belong to the same genus, Dichogaster. As one might predict, all six of the endemics are high elevation species, which suggests they are present in habitats up and out of the reach of the 500 years of agricultural activities. Conversely, all of the widespread non-endemic species appear to be confined to the cultivated lowlands. 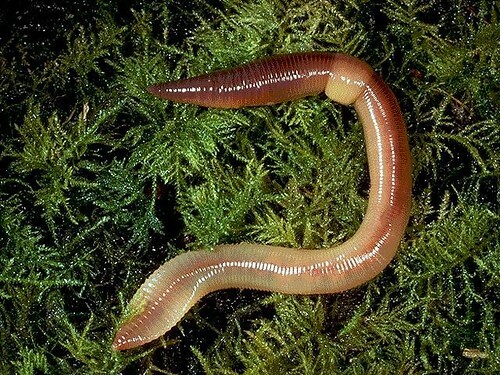 All of this suggests that the six endemic earthworms are the result of a species swarm or explosion. 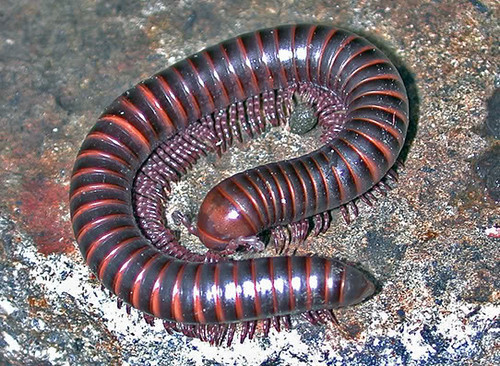 Currently, we know less about the millipede fauna but what we do know suggests they may a species swarm as well. 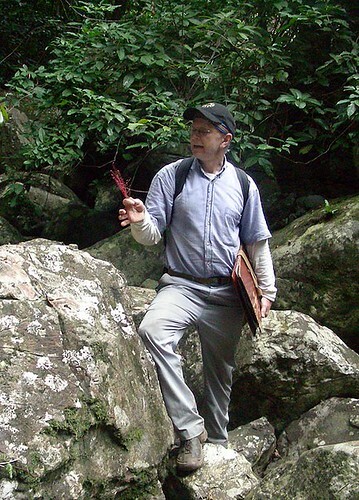 In the May blog, I reported that we had found the first saprophytic plant on Sâo Tomé and Príncipe; Sciaphila ledermanni is a very rare plant indeed, and Dr. Tom Daniel’s publication on the discovery will soon be published. Saprophytes are plants that lack chlorophyll and, in this case, depend on fungi to provide sustenance from dead or decaying matter. S. ledermannii is otherwise known only from Nigeria and Cameroon, well to the north of our islands; our discovery of this plant along two small rivers on Príncipe is intriguing, in part because of the possibility of the Niger River as its colonization pathway. 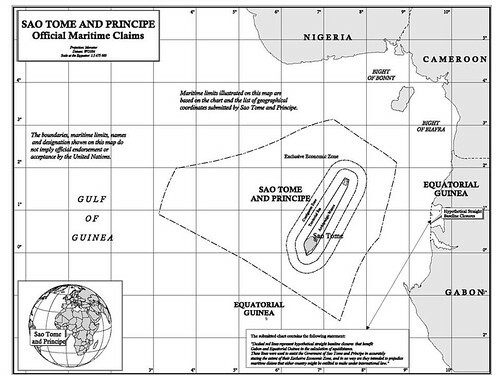 In an much blog I discussed how my colleagues and I hypothesized that the most likely explanation for how the ancestors of the current endemic species colonized the islands was by rafting; our reasoning is based on a combination of the existence of the the two huge rivers that enter the Gulf (the Congo and Niger), the directions of the main oceanic currents in the Gulf (probably unchanged since the Cretaceous) and the fact that surface salinity drops significantly during rainy periods. 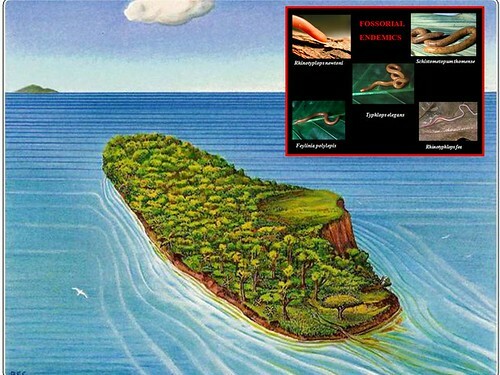 The inset in the image of the raft above includes pictures of the endemic burrowing reptiles and amphibian found only on the islands; these species do not swim or climb trees, their presence strengthens our large floating raft hypothesis. In this 2007 publication, we did not suggest one river or the other as being the likely dispersal pathway to the islands; we just presented the evidence that either was possible. In the case of our newly found Sciaphila, it would seem that the Niger region might be the most likely source area for this species. An old friend of mine, Angus Gascoigne, just sent me a series of emails regarding another species with a distribution that is also very suggestive of the region of origin. 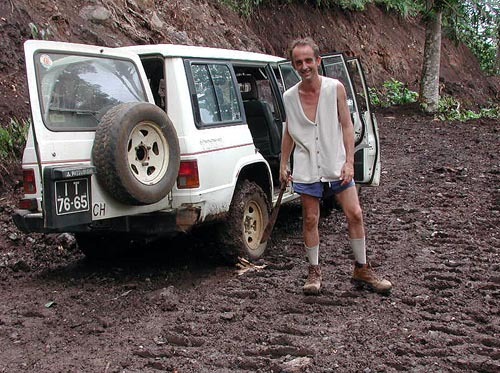 Angus first came to the islands as an English volunteer (VSO), then worked for many years as chief technician for the Voice of America in Sâo Tomé. He currently teaches at the Instituto Superior Politecnico and is a lead biologist for ABS, the new association of Sao Tome biologists. He is a gifted naturalist, has lived on Sâo Tomé for over 20 years and published on everything from snails to Begonias. 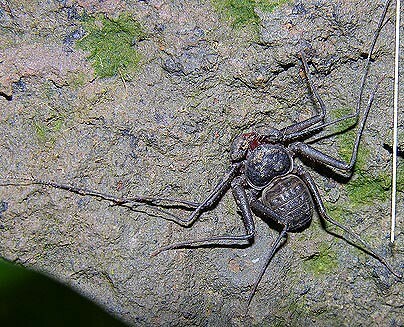 Angus wrote of finding a whip spider, or amblypygid, in the garden of his home in the town of Trinidade on Sâo Tomé. To some, whip spiders might be the source of nightmares, looking vaguely like flattened, fast-moving spiders or scorpions. 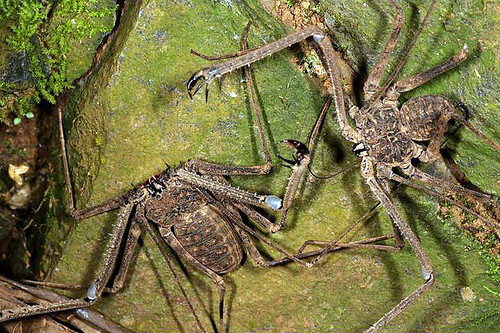 In fact, they are neither; they have their own order within the arachnids, the Amblypygi. 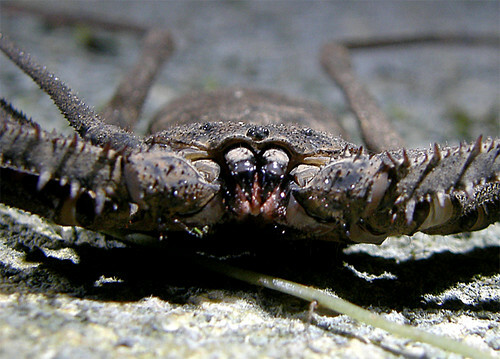 They are non-venomous, usually nocturnal predators on other arthropods . We herpetologists do a lot of work at night, and we have encountered them fairly frequently on rock walls, and bridges on Sâo Tomé. Angus and his colleague, Hugulay Maia, also of the ABS, have begun a study of these odd creatures, and they inform us there are two species known from the islands so far: Charinus africanus, which is considered an endemic to all three oceanic islands, and Damon tibialis. D. tibialis is currently known only from Sâo Tomé, the Democratic Republic of the Congo, and northern Angola, near the mouth of the Congo River. As we must always bear in mind, it is quite possible that D. tibialis was inadvertently brought to the island by the Portuguese, and we cannot know for certain until we can look at their genetics. 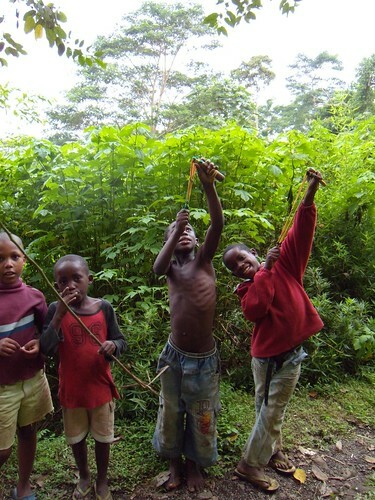 But assuming this whip spider got to the island by natural dispersal, its current distribution might represent an example of the Congo as a source path as opposed to the Niger. 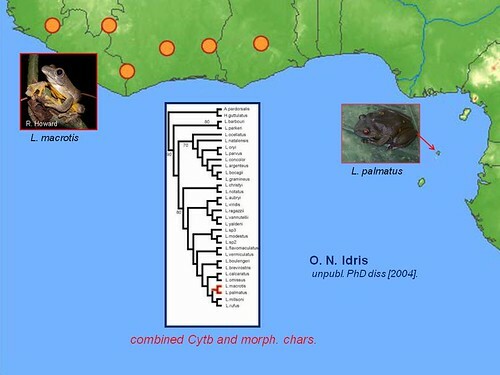 Another possible Niger contribution is the ancestor of Africa’s largest treefrog, Leptopelis palmatus, found only on Príncipe. It’s distribution and that of its presumed closest relative is pictured below. I have little doubt that both major rivers have contributed to the founding populations of the marvelous endemic biota of the Republic of Sâo Tomé and Príncipe. Before signing off, here is an update on our opening “nightmare” image, sent by our friend Polly Anderson, who took the photo. I just received it as I was concluding this posting. Author islandbiodiversityracePosted on July 9, 2010 Categories Biodiversity, biogeography, caecilian, flowers, frogs, Gulf of Guinea, invertebrates, Island endemics, millipedes, principe, Sao TomeLeave a comment on The Race: Nightmares, Explosions and Geographic Origins.